The Capped Head Left half eagle series, minted from 1813 to 1834, suffered the most destruction from these melts. 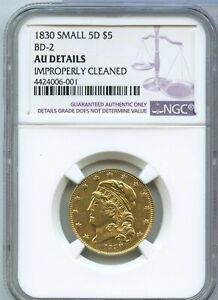 Made during the period when widespread melting took place, much of the mintage never saw circulation and commonly went straight from the Mint into bullion dealers' hands. Some forty-thousand pieces of "recent mintage" were destroyed in a single Paris melt in 1831. The small quantities that survived the melts before 1834 were decimated by the Mint's later recoinage of the old-tenor pieces. Making its debut in 1813, John Reich's Capped Head Left design for the half eagle was copied by Chief Engraver Robert Scot in 1818 and extensively reworked by William Kneass in 1829. Reich modified his earlier Capped Bust design by eliminating the bosom and drapery of Liberty, leaving a large head as the central device, surrounded by thirteen stars with the date below. The reverse, only slightly altered from his 1807 design, depicts an eagle with widespread wings, clutching an olive branch and arrows. Surrounding the eagle are the inscriptions UNITED STATES OF AMERICA and 5 D., with the motto E PLURIBUS UNUM above the eagle's head. While Scot's 1818 revision was a crude copy of Reich's engraving, Kneass' 1829 modification was a distinct change. Diameters were reduced from 25 to 22.5 millimeters, the portrait appeared in higher relief, and a beaded border replaced the denticles of the previous coin. When discussing this series, the word "rarity" loses its meaning. Although the Philadelphia Mint produced 1,385,612 business strikes and approximately 150 proofs over a 22 year period, there are no common dates. The 1813 is most often encountered, with many of the several hundred survivors probably saved as first-year-of-issue souvenirs. 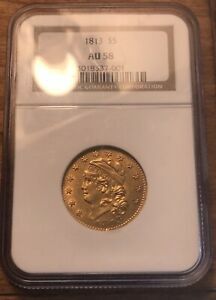 Beginning a list of rarities unique in U.S. coinage is the 1814, with only a few dozen pieces known. The following year produced one of numismatics' most celebrated coins, the low-mintage 1815, until this century considered the rarest date in the series. Only twelve pieces survive. The 1818 and 1820 issues are occasionally available, with the latter date appearing more frequently. Coins of 1819 and 1821 are much more elusive. The 5D/50 variety of 1819, with only seven examples known, is rarer than the 1815 issue but has never achieved equal fame. 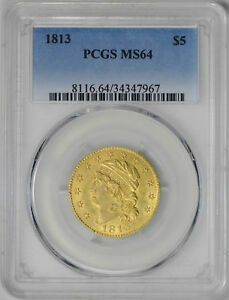 Next is the legendary 1822 half eagle, perhaps the greatest rarity of all U.S. coins and one of the most famous. Only three specimens exist today, with two permanently impounded in the Smithsonian Institution. 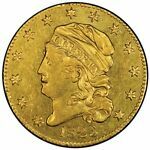 This coin last appeared at public auction in 1982, when it realized an astounding $687,500 in the famed "Eliasberg Sale." It's believed that 40-50 examples exist dated 1823, making it one of the more "common" dates of this type. For 1824, only 20 or so pieces are known. In 1825, there were two overdates struck, 1825/1 with perhaps 15-20 examples extant, and 1825/4, another icon of rarity: only two pieces exist. Both 1825/4 half eagles are in private collections, with the second example unknown until 1970, when it was found in a Michigan bank vault as part of the N.M. Kaufman collection. 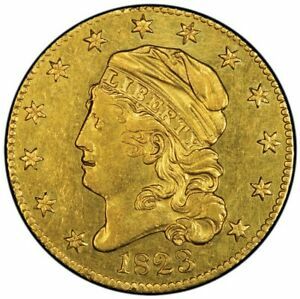 Following this legendary coin are a string of elusive to impossible issues including 1826, 1827, 1828 and 1828/7, with survivors ranging from fewer than six pieces (1828/7) to as many as two to three dozen (1826). The final year of the large diameter coins, 1829, is about equal to 1828/7 in rarity, trailing only the 1822 and 1825/4 pieces. With so many great rarities in the series, Capped Head Left half eagles are generally regarded as a type coin and even then are usually pursued only by advanced collectors. With the exception of Louis Eliasberg's holdings, almost all the great collections formed of this series were completed or at least started in the 19th century, most notably those of Stickney, Jenks, Steigerwalt, Dunham and Garrett. In the summer of 1834, Congress passed legislation lowering both the weight and fineness of U.S. gold coins. More than a generation had passed since half eagles were seen in commerce, and the new, lighter weight Classic Head coins were readily accepted and widely circulated. Continuing melts of the old-tenor pieces made Capped Head Left half eagles the rarest series of Federal coinage, and today even a single example is often the highlight of many collections. Akers, David W., United States Gold Coins, Volume IV, Half Eagles 1795-1929, Paramount Publications, Englewood, OH, 1979. Bowers, Q. David, United States Gold Coins, An Illustrated History, Bowers and Merena Galleries, Wolfeboro, NH, 1982. Breen, Walter, Early United States Half Eagles, 1795-1838, Numismatic Scrapbook Magazine, Hewitt Brothers, Chicago, 1966. Palmer, R.R. and Colton, Joel, A History of the Modern World, Alfred A. Knopf, New York, 1969.